When looking for a skin care product any product named "Serum" and that too with "Vitamin C" attracts our attention as one can only expect skin goodness with theses labels. 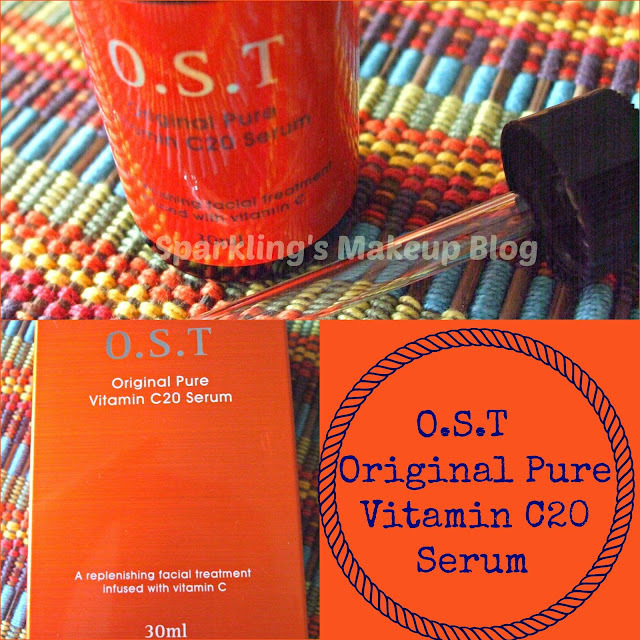 Lately I have been using O.S.T Original Pure Vitamin C20 Serum, so was it worth it or Not? To Reveal More Read More!!! the fastest effect with Vitamin C.
Need to tone up loose skin for keeping youth. The packaging is all Red from outside and all inscription is in Korean language except the name, but don't worry the details of product and its usage is available on the site here. It is further packed in a white hard-paper over all. There is one Bottle made of dark tinted glass, to secure the product inside from harm of sunlight I assume, it has a plastic twist-lock black cap. Includes one dropper which seems to be made up of fine glass as well, I don't wanna test it as it may break :p Expiry date is clearly typed on the flip along with the manufacturing date, that's safe! Skin care is a must when one is in late 20's as this is the real time when ageing and all other factors, including maternity issues, hormones and Bla! Bla! start having and leaving effect on the face. Well Luckily I am one of those people whose face never tells the real age (*touch wood*) but still, as I know my exact age so I am taking every preventive measure against any skin disaster. I have setup a routine, which I am unable to follow on daily basis but still try to be regular at least every alter day/night. I added OST Original Pure Vitamin C20 Serum into my night skin care routine/regime as then I have ample time to shift on products step by step. The serum can be applied easily as the thoughtful manufacturers have packed it along with a very sleek dropper. After cleansing and toning your face, apply it in drops all over your face and gently massage it. After this I apply my night cream and go to sleep. I believe the skin care products works best at night as that is a relaxing time, what is the use of doing this all routine in hassle and then stand in kitchen and do other home chores. Now the wonders this one is doing to me and my facial skin; I have few scars of scratched blackheads (my only bad habit) and zits (due to facial waxing), I have noticed a clear change in the intensity of these scars, they are fading but that too after use of a week and plus. I have few open pores, which are not BIG luckily, on those I haven't noticed any change but yes they are cleaner now. In first few days all the blockings of my pores just sprung out, which were easily removed with my exfoliating face wash. I was not upset as I know every cleaning agent will make these little white/black heads go, so did this one and after that the pores are clean. My facial skin is feeling soothing, soft, clean and pure! Every beauty has a beauty spot, so does this: #1 it can give tingling feeling if you use it after proper cleansing and toning, but it is a passing phenomenon and won't hurt, just few seconds and its gone. #2 you can not just keep it any where as it is pure Vitamin C so it must be kept in a cool and dry place, any exposure to sunlight can make it change its colour, means loosing its quality. I keep it in my Bath-room in the cupboard and that too in the packaging so even if suddenly Sun comes-by it doesn't have a look at my Red Bottle :p I know that is risky but the lazy person like me can't take the risk of not using this one only for the reason of walking to the fridge every time. So be careful but if you can get hold of this then DO! 4.5/5. Totally recommended if you are a fellow skin care freak. 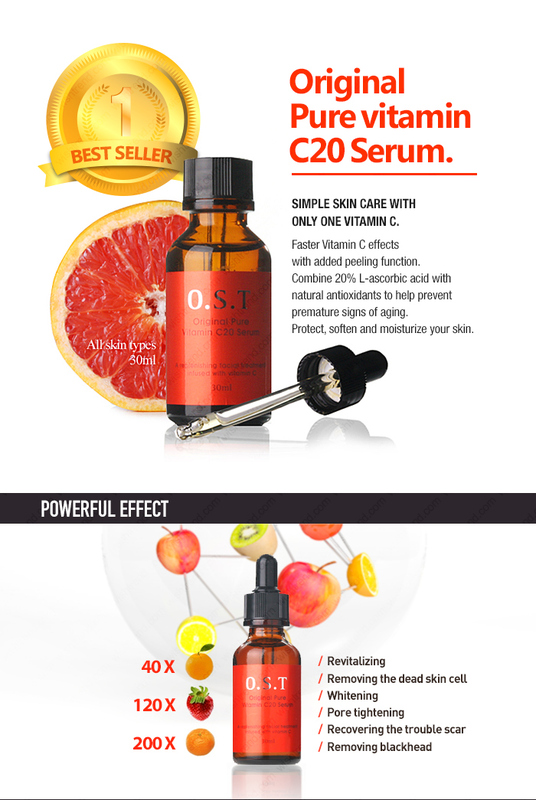 O.S.T Original Pure Vitamin C20 Serum is available for USD 24.99 at Wish Company, check it on there website. They ship worldwide. Join Wish Company Facebook fan-page. Do read my posts on Skin care. Do read my posts on Serum. Hope you like this review post, do comment, share, like, tweet, G+ and pin it. Do you prefer using a serum in your skin care routine? Which is your trusted one?